Finding a friendly, dependable and capable team of movers in the area of Whitechapel can be quite challenging. However, consider this a problem solved as you just found the website of the most reliable people to hire for the job. We established our moving company years ago and this is why today we are regarded as moving veterans. Since them we have worked on an innumerable account of relocation projects of diverse scale, complexity and timeframe. 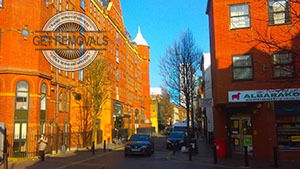 Having gained tat experience and making a name for ourselves – we are known to be the moving company to hire when it comes to removals in Whitechapel. We have managed to complete quickly and swiftly even the grandest removal projects because of our skills and sufficient manpower. At the moment we are the moving company with the larges team of professional removalists not only in the area of Whitechapel but the entire city as well. Also it is because of our huge team of movers that we are able to work on several removal projects simultaneously. Our policy is to never turn down a customer and always take on their projects. Even more we are one of the few moving companies in the area that will gladly allow you to rid in the moving van during the transportation stage of your removal in Whitechapel. This way you will be able to witness for yourself that our drivers are indeed highly qualified professionals and that they are taking good care of the transported items. If you are looking for a cost effective way to relocate your home or office, or perhaps single items of value by all means turn to Get Removals. The company handles all types of property removals and a variety of goods delivery services. Our services are versatile, inexpensive and always deliver genuine value for money. We maintain and provide a number of additional options, available separately or as part of the removal service itself. The company is licensed to organise and carry out domestic and commercial rubbish removals and property clearances. We also offer specialised packing and storage solutions and professional home/office cleaning. As we already mentioned we are seated in the London district of Whitechapel. The district lies in the eastern parts of the English capital and is part of the London Borough of Tower Hamlets. Charing Cross, London’s main intersection is situated at approximately three miles from the district of Whitechapel. The district is known throughout the city and country for being the home of one of the largest Bangladeshi diasporas in the United Kingdom. The district is served by the Whitechapel Station which is one of the busiest stations in the English capital. The station was opened in 1876 and currently served more than 17 million people on a yearly basis. Whitechapel is an area of London’s East End, which is best known as the hunting ground for infamous serial killer Jack the Ripper. Whitechapel has traditionally been a popular place of residence and hang spot for working classes and immigrants, partly due to its close proximity to London Docklands.